Just a while ago the first 4K 144 Hz monitors became available with the ASUS PG27UQ and Acer X27. 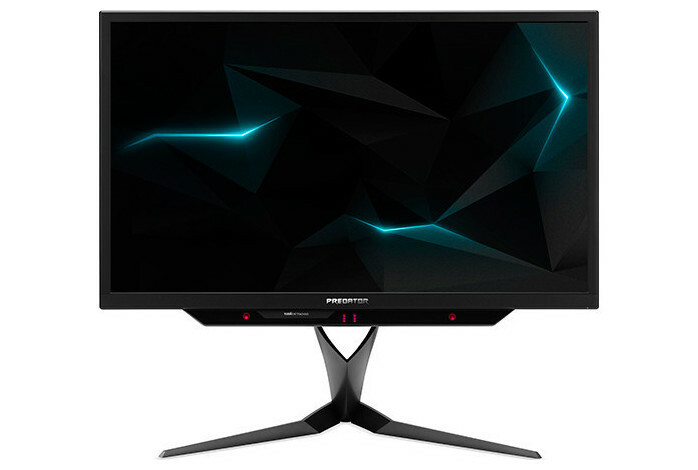 These $2,000 monitors no longer force gamers to pick between high-refresh rate or high resolution, since they support 3840x2160 and refresh rates up to 144 Hz. However, reviews of early-adopters report a noticeable degradation in image quality when these monitors are running at 144 Hz. Surprisingly refresh rates of 120 Hz and below look perfectly sharp. The underlying reason for that is the DisplayPort 1.4 interface, which provides 26 Gbits/s of bandwidth, just enough for full 4K at 120 Hz. So monitor vendors had to get creative to achieve the magic 144 Hz that they were shooting for. The solution comes from old television technology in form of chroma subsampling (YCbCr), which, in the case of these monitors, transmits the grayscale portion of the image at full resolution (3840x2160) and the color information at half the horizontal resolution (1920x2160). This approach is called 4:2:2 and works particularly well for the movie industry, where it is pretty much standard to ship the post-processed content to cinemas and TV using subsampling of 4:2:0 or 4:1:1. For computer generated content like text and the operating system interface, chroma subsampling has a serious effect on quality, especially text-readability, which is why it is not used here at all. In games chroma sub-sampling might be an acceptable approach, with negligible quality effects on the 3D game world, and slightly loss of sharpness for the HUD. The images below describe how chroma subsampling works and how it affects image quality. Note how high-contrast edges look noticeably worse while low-constrast surfaces look nearly identical. Considering that gamers have been demanding 144 Hz on their 4K monitors for quite a while, and NVIDIA has been pushing for it, too, I'm not surprised that monitor vendors simply went with this compromise. The bigger issue here is that they have been completely quiet about this and make no mention about it in their specification documents. Technical solutions that can avoid subsampling include HDMI 2.1 and DisplayPort's DSC data compression scheme. HDMI 2.1, was just specified in December last year, so controller vendors are just figuring out how to implement it, which means it is still far away from getting used in actual monitors. DisplayPort 1.4 introduced DSC (Display Stream Compression), which is particularly optimized for this task. Even though it is not completely lossless compression, its quality is much better than chroma subsampling. The issue here seems that not a lot of display controller support exists for DSC at this time. Nothing new there then, as consumers are continuing to be used as guinea pigs for new technology. Not just guinea pigs, they are also being fed misinformation or being told something is "X" because it has X's feature(s) (or some of them) but it's not actually X implemented correctly/fully. If I'd bought one of these monitors, I'd have returned it for a full refund for this. It should explicitly state the loss of quality on the product page as it's a material purchase decision. I would be running such a monitor at 144Hz on my desktop all the time, so I'd always have to put up with an inferior picture. No thanks. Great informative read. So basically, we just need to be patient for better prices and tech standards like HDMI 2.1 to come. I know these monitors have a fan that turns on inside as well, because they run so hot. Seems so dangerous to me, lol... really going to take a hard pass on these new monitors, and any that require a fan... can't be good for longevity. At this point I'm not even sure why these were pushed to 144Hz. I highly doubt there's a noticeable difference between 120 and 144Hz and it looks like a 120Hz design would have been much simpler (thus cheaper). My 1080p monitor does 144Hz and there's a visible difference, I can tell you. Definitely worth having the higher refresh rate. It's all subjective. I actually hate 60hz, 75hz. but 90-100hz is what I love the most, 144 and 165hz and 240hz seem to fake to me. 100hz is my sweet spot and always will be i think. i have tried over 20+ monitors in last few years. Visible difference compared to what? Because I was talking about the difference between 120 and 144Hz. Why is nVidia behind everything like this? 120hz is just good. does they use 144hz just because it "sounds" better? This kind of cheap things is usually seen in cheap AMD's Freesync, not from superior G-sync. I remember playing WoW beta on my CRT with an ancient ATI gpu, it was so fluid looking I loved it, was instantly hooked. Wish I still had that setup actually, idiot me threw it all away a long time ago. I wish CRT would make a come back, I miss gaming on mine, I had some fun times with it. Yes of course, that's what I was talking about. That was in the context of your 120/144 comment. I guess it looks hyper-real when it refreshes that fast, with very little motion blur, while in everyday life, we see motion blur all the time. Anything that eliminates it, for me, is great as I can see so much more. Note that everyone else can see so much more too, which is why it feels odd to them. I guess it looks hyper-real when it refreshes that fast, with very little motion blur, while in everyday life, we so motion blur all the time. Anything that eliminates it, for me, is great as I can see so much more. Note that everyone else can see so much more too, which is why it feels odd to them. Huge difference between CRT and LCD though. CRT: no image to speak of, just a dot moving at huge speeds to trick your eyes into seeing one. LCD: image is always there, but you can't refresh it as fast. When CRTs were everywhere, virtually everybody in their late thirties who used one at their job, had to wear glasses. Up until recently I had and still used an original Fluoro backlit LCD monitor, and that thing ran hot enough to warrant a fan or two, I guess it would still be alive if it had them. Haha, is this for real? i will never buy a monitor with a fan. Acer could not take the time to make a design without fan then they are not worthy of my money. I don't even see the big deal about144Hz. 120 is plenty fast already. This is what you get when you jump on trends as they surface. ...that's not an excuse for manufacturers though. I don't know the first thing about how these are being built, but given the number of pixels they have to move each second, it may not be possible to do it without active cooling. See qubit's response above. When users swear by 144Hz and your competition sells 144Hz, you either follow suit or risk being left behind. From marketing point of view, it makes perfect sense.